1. Who is responsible for the costs and expenses associated with a dog attack in Ohio? The owner of a dog is responsible for the dog attack victim’s costs and expenses. Ohio’s dog bite laws say that if a dog attacks and bites someone, the dog’s owner is responsible in most cases. A victim does not have to prove the dog’s owner was negligent. The dog owner is responsible unless you were trespassing, teasing or tormenting the dog. 2. Could anyone else be held responsible for a dog bite other than the dog’s owner? Yes. A keeper of a dog may be liable. For example, the dog’s owner leaves a dog with a parent while he or she goes out of town. That parent is the keeper of the dog and has liability if the dog attacks someone. A harborer of a dog may also be liable. A harborer is a person who controls the place where a dog lives. For example, a son or daughter who lives with their parents owns a dog. These parents are harborers. 3. What types of compensation can a dog bite victim receive for their injuries? Dog bite victims are entitled to compensation for all medical bills, lost wages, damaged clothing, damaged eyeglasses and other personal items linked to the dog attack. A dog bite victim may also receive compensation for the pain and suffering associated with the dog attack. In most dog bite cases, this is often the largest part of the claim. 4. How long does a dog bite victim have to file a claim for their injuries and damages? If a dog bite victim files a claim under Ohio’s strict liability statute, it is six (6) years. If the dog bite victims files under a negligent claim, it is two (2) years. Every case is different and there are exceptions. It’s important to contact us as soon as possible for a free consultation. We will provide you with the specific information you need. 5. How long does a dog bite claim take from beginning to end? There is no one answer to this question. Every case is different. 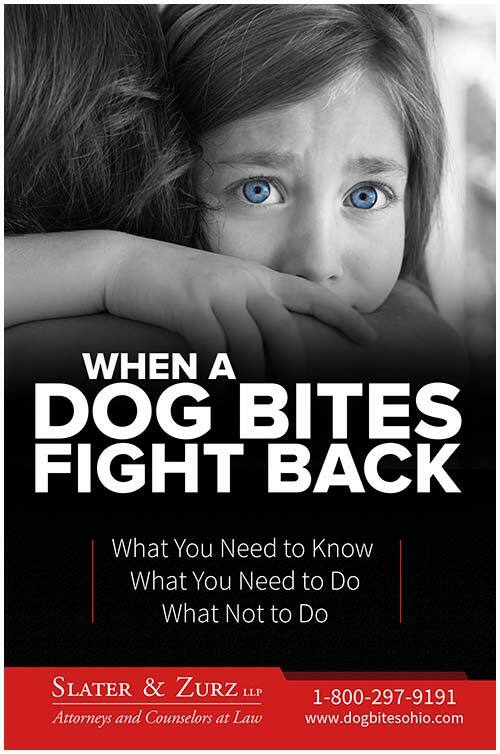 Many dog bite cases can be completed in as little as 90 days after a victim finishes his or her medical treatment. However, if there is scarring involved, it is important to wait to determine how the wounds heal and if further treatments are necessary such as cosmetic surgery. 6. What if the dog’s owner is a friend or a relative? A dog bite claim is handled by an insurance company, not a friend or relative. In Ohio, dog bite victims are entitled to be compensated for their injuries even if the dog is owned by a friend or relative. 7. What can be done to prevent the dog from attacking again? An attack should be reported to local police, local health department and local dog warden. A dog may need to be quarantined for rabies. The dog may also need to be labeled as a vicious dog, as defined by Ohio law. If so, the dog owner may be required to take actions to prevent attacks. 8. What dogs are defined as vicious dogs under Ohio law? In Ohio, a dog is not classified as vicious just by its type of breed. Under Ohio law, a vicious dog is any dog that, without being provoked, has killed or caused serious injury to any person. 9. Is the owner of an apartment complex liable if a dog bites someone on apartment property? Generally, landlords are not liable for a dog attack caused by a renter. However, there are exceptions. Contact us for a free consultation to discuss your dog bite case. Get the answers you need and the guidance on what to do next. Call 1-888-998-9101.